The first River Talk of the season kicked off on Oct. 24 at the Estuarium on Barker’s Island in Superior, Wisconsin. People gathered to listen to Kelsey Prihoda, a researcher with the Lake Superior Research Institute at the University of Wisconsin-Superior, describe her work with groundwater. Although groundwater is just a small fraction of the water on the planet, it is vital. Residents in northwestern Wisconsin receive drinking water from over 48,000 private wells. Thirteen percent of the United States’ population and 11-30 percent of the population in Minnesota and Wisconsin obtain their water from private wells, according to Prihoda. The difference between public and private water supplies is that public water serves a community of at least 25 people, is regulated by the U.S. Environmental Protection Agency Safe Drinking Water Act and is monitored for contaminants on a regular basis. Private water systems generally serve a single home and are not regulated or monitored, so the burden falls on homeowners to test their water for contaminants. Because groundwater serves as drinking water, people must be careful of contaminants in it, Prihoda said. When she started looking into what kind of contaminants are in northwestern Wisconsin wells, she found a frustrating lack of data compared to other parts of the state. To rectify this, she began a monitoring project that started on July 1, 2018, and will end on Dec. 31, 2019, to study what contaminants are found in local groundwater. Prihoda reached out to various organizations in 11 counties for help in distributing water-sampling kits. The plan? To collect 700 fluoride samples and 111 metal samples all from volunteers. The fluoride she is looking at occurs naturally in groundwater. The metals she has chosen to look into include arsenic, manganese, aluminum, iron and lead. Children need fluoride to grow strong teeth and bones, but too much in water (concentrations greater than 1.5 milligrams per liter) can lead to permanent damage of tooth enamel. “That’s why it’s important for parents to be aware of the fluoride concentration in their private well water,” Prihoda said. With the exception of lead, all the metals in her study occur naturally in groundwater. Elevated levels of arsenic can cause cancer, nerve damage and cardiovascular disease. High levels of manganese and aluminum can be toxic to the central nervous system. Exposure to high levels of iron is associated with diabetes and cardiovascular disease. Lead enters water most commonly through corrosion of brass or chrome-plated brass faucets and plumbing that contains lead solder. Lead exposure is a serious health concern and causes central nervous system damage, especially in children, which can lead to learning disabilities. The sample kits handed out to volunteers will measure the amount of these metals and fluoride in their groundwater to determine levels of these contaminants and make the population more aware of what to look for in their water. At the end of this project, Prihoda plans to release all of the newfound information publicly through presentations. The data will also be available on the internet so people can easily access it on the Wisconsin Well Water Quality Viewer. This will hopefully just be the beginning. 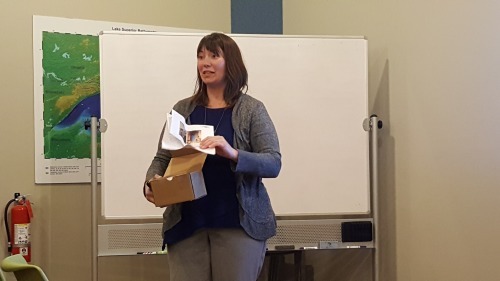 River Talks is an informal monthly series about the St. Louis River Estuary held at the Estuarium on Barker’s Island in Superior, Wisconsin, hosted by the Lake Superior National Estuarine Research Reserve and the Minnesota and Wisconsin Sea Grant programs. The next talk will take place at 7 p.m. on Nov. 14 and will focus on sediment plumes in the Duluth-Superior Harbor and Lake Superior.